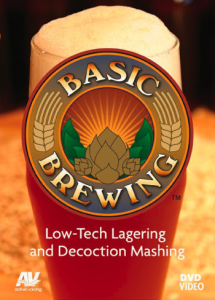 Decoction mashing and lagering are advanced techniques that have been passed down through generations. It took old-style brewers many years to perfect these brewing methods, but you can learn them in just a few minutes with this DVD. In this video, James Spencer and Steve Wilkes, are your tour guides. Steve takes you through decoction - boiling part of the mash to reach higher temperatures and add flavor character in step mashing. James leads the way in showing how to achieve lager fermentation in a low-tech way, even in the heat of summer. These techniques also can be used to maintain proper ale fermentation temperatures in hot climates. This video is aimed at brewers who already know how to make a batch of beer using extract or all grain brewing techniques.